Do you often feel overwhelmed as the parent of an ODD child? Kimberly Abraham and Marney Studaker-Cordner have worked with parents of kids with Oppositional Defiant Disorder for 20 years—and Kim is the parent of an adult child with ODD. Read on to find out the 5 things you need to know to be a more effective parent. Raising an ODD child is like belonging to a special kind of club: it’s the “Special Forces Unit” of parenting. When you have an ODD kid, you encounter situations parents of “typical kids” would never dream of. What’s worse, you didn’t volunteer for this duty—it’s much more akin to being drafted. And while you’re trying your best to parent a very difficult child, you’re often misunderstood by professionals and other parents who are raising typical kids. It helps to remember what’s driving your child’s behavior: the need to be in control. Blaming yourself or your child won’t help the situation and can leave you feeling angry and resentful toward him. To make matters worse, you’ll come away feeling guilty on top of it. It’s good to hold your child accountable for his actions, but when it turns to blame, it will only worsen feelings of resentment. Besides, kids are quick to blame others for their own behavior. Instead, you want to be a role model for them by taking responsibility for your own feelings and actions. Keeping A Tab Just Leaves You with a Huge Bill. With Kim’s son, she says that it was never that he’d done “just one thing—it was that he’d done twenty things over the course of a day (or sometimes an hour).” So it wasn’t just that he’d refused to take care of his dishes, it was that an hour before that he’d kicked a hole in the wall, and an hour before that, he’d gotten in a fight with his brother. She kept a running tab in her mind of everything he’d done wrong. It left her feeling overwhelmed and hopeless. By the time he refused to take care of the dishes, she’d had enough. She could give you a tab of offenses he’d committed back to the time he was six and threw mashed potatoes on the wall just because he was bored! But there’s another side to that coin: her son would also give her a running tab of the mistakes she’d made as a parent, back to the time he believed she sold his toys at a garage sale. It was a recipe for arguments and power struggles. Just as parents want the chance to learn from our mistakes and start each day fresh, our children deserve the same. Though sometimes it’s difficult to separate these actions out, try to make your responses fit the specific behavior, instead of the running list you have going in your head. In other words, don’t let your child’s bad behavior compound until there’s no punishment or consequence big enough for them. Tug of War Will Give You Rope Burn. It helps to remember what’s driving your child’s behavior: the need to be in control. When faced with loss of control, ODD kids will often go to extremes to fight against authority. Suddenly, you’re no longer focused on the behavior or issue at hand; you’re in a power struggle. Rather than your child learning from consequences, things quickly get way off topic. You might start out trying to address your son’s grades in school, and end up arguing about whether or not you threw away his Matchbox cars when he was four years old. But engaging in power struggles will leave you exhausted, frustrated and often confused as to what the heck just happened! Our advice is this: When you find yourself in a tug-of-war over control, try letting go of the rope. And ask yourself, “What is my intention in this discussion?” If you’re simply arguing with no clear direction or purpose, it’s probably not a discussion that needs to occur. The best thing to do is walk away. Remember, it takes two to tug on that rope. If you keep pulling on your end, you’re likely to end up in the mud. Sometimes an Answer Isn’t Required. Sometimes kids just need to vent. Ever find yourself needing to get something off your chest, but you’re not really looking for an answer? As parents, we tend to jump in and try to solve what we view as our kids’ problems. Sometimes when they’re complaining or upset it doesn’t really require a response from us beyond, “I hear what you’re saying.” Kim used to go into “fix-it” mode with her son, offering solutions to problems despite the fact that he hadn’t even asked for guidance. Not surprisingly, he would shoot down every one of her suggestions and then get angry at her. Why? Because he didn’t really want her to solve anything. If your child is looking for an answer or response, they’ll ask you. Otherwise, try just listening without jumping in to help. Allow your child to have his feelings, and know he’s been heard. Change Your Thoughts. The way you think about things determines how you feel and act toward your child. If your thoughts are negative, it will affect the way you interact and respond to his behavior—and to him as a person. See if you can catch hold of things that are popping into your mind and replace them with more positive thoughts. For example, when “Jack” digs his heels in on something, instead of thinking, “He’s so stubborn; everything’s an argument,” try to change that thought to, “He’s certainly determined.” Changing your thoughts can help you change how you’re feeling toward your child. When someone pushes against you, the natural instinct is to push back. When Kim’s son pushed against her in defiance, she said she “often found herself pushing back in reaction, without even thinking about it.” Your child may have the type of personality that will continue to push against others and fight against being controlled in any way. Make no mistake, raising an ODD child is an emotional and challenging experience. It’s a process of trying to be creative, because you have to constantly look for “things that work” with a child whose very essence is to fight against being controlled. The truth is, your child’s personality isn’t likely to change, but if you use these tips we offer, you’ll find yourself engaging in that conflict less frequently and less intensely. As Kim says, “I found that it was hard for my child to argue without a partner in the process. By changing how I responded to him, over time our relationship changed.” If you’re able to alter the way you respond to your child, the result will be less conflict and more peace in your home. And by modeling the techniques we’ve given you, you’ll be teaching your child conflict-resolution skills, de-escalating techniques, healthy relationship skills and coping skills. The best part? You’ll be able to end the day feeling good about yourself and knowing that you gave it your best. 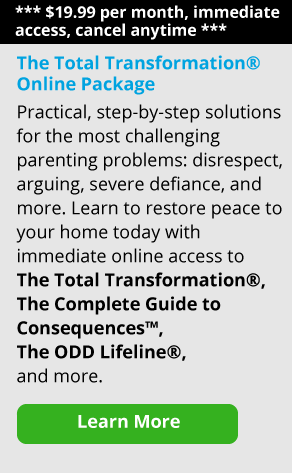 Kimberly Abraham and Marney Studaker-Cordner are the co-creators of The ODD Lifeline® for parents of Oppositional, Defiant kids, and Life Over the Influence™, a program that helps families struggling with substance abuse issues (both programs are included in The Total Transformation® Online Package). Kimberly Abraham, LMSW, has worked with children and families for more than 25 years. She specializes in working with teens with behavioral disorders, and has also raised a child with Oppositional Defiant Disorder. Marney Studaker-Cordner, LMSW, is the mother of four and has been a therapist for 15 years. She works with children and families and has in-depth training in the area of substance abuse. Kim and Marney are also the co-creators of their first children's book, Daisy: The True Story of an Amazing 3-Legged Chinchilla, which teaches the value of embracing differences and was the winner of the 2014 National Indie Excellence Children's Storybook Cover Design Award. 5. Defiant Child Behavior: Is Your Child's Bad Behavior Escalating?